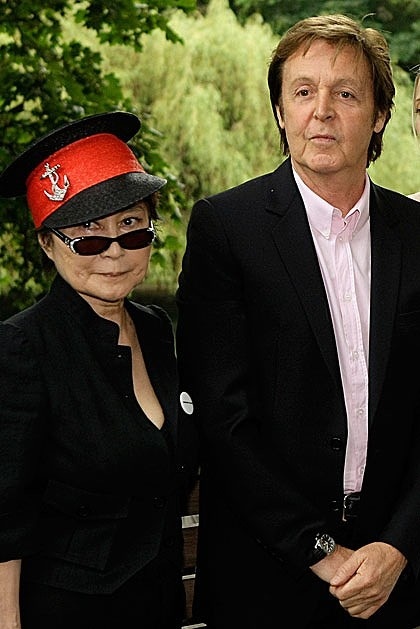 This just in: Paul McCartney & Yoko Ono seem to have put their legendary differences aside to promote the Meat Free Monday campaign, which is, well, exactly as its name suggests. There’s nothing particularly new about this notion. U.S. Presidents Truman and Roosevelt asked folks to give up eating animals during both World Wars. And public health officials, like the good folk at Johns Hopkins Bloomberg School of Public Health, have promoted the idea from a public-health perspective for years. But last year, one of the world’s leading authorities on climate change, Dr. Rajendra Pachauri, declared that going meat-free once a week was the most attractive way for individuals to reduce greenhouse gas emissions, lower their carbon footprint, and save scarce resources. Bingo! A new movement was born with a double-whammy agenda. And Sir Paul’s got the, ah, chops to pull it off. The idea is getting play in the film world as well. The just-released doco Food Inc. lists going without meat one day a week in its top ten actions humans can take to support a sustainable food system. I can report that tonight, campaign launch day no less, I did indeed go meatless. Baked tofu, marinated in tamari, pickled ginger, garlic, and lime juice, served over sweet, short-grain rice and topped with spinach wilted in a little grapeseed oil was on the menu. But to be honest, I hadn’t gotten wind of the campaign until I sat down at my computer AFTER dinner. So no brownie points for me. I like the sound of Meat Free Mondays (nicely alliterative) but the real reason the first day of the week got picked for the job is it’s the day, apparently, when most of us set our intentions for the week. (The hope is that some people may go on to Tempeh Tuesdays, Wakame Wednesdays…you get the idea). Here’s what I want to know: Do campaigns featuring famous folk make you more or less likely to join in? Some of us, of course, are quite happy to be told what to do and herded along like, um, cattle. As a veg-head, it’s not going to change my behavior. But as a rebellious spirit I can see how such a pronouncement might make a contrary carnivore dig in his heels and cook beef at the beginning of the week. And for omnivores of the world the Boomtown Rats classic “I don’t like Mondays” may hold new meaning. So tell me: How do you feel about an ex-Beatle asking you to swap seitan for steak on Mondays — or any other night of the week for that matter? I noticed that you discussed the film Food Inc. and I wanted to let you know about a film called Our Daily Bread which I think you would find fascinating. It’s similar to Food Inc. in how it illuminates the horrific reality of industrial agriculture, however; Our Daily Bread is not an advocacy film in the traditional sense. The film communicates its messages using provocative images of places where food is produced by going deep inside the world of high-tech agriculture. Our Daily Bread touches on animal husbandry, labor issues, and the shocking reality of food production with a very distinctive style. Thanks for letting Lettuce Eat Kale readers know about Our Daily Bread. Where can folks who want to watch the film see it? Previous post: What Do You Eat When You Eat Alone?